The leaves are beginning to turn and in most parts of the country, the summer heat has come to an end. To American college football fans, that means one thing: the season is here! 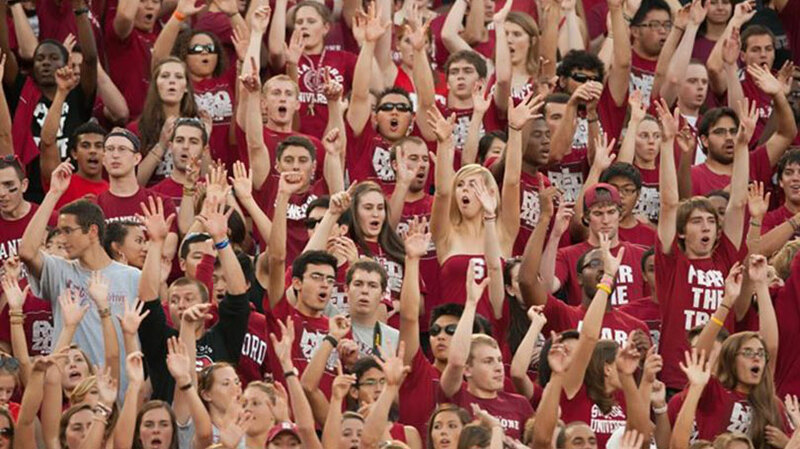 Each Saturday, fans support their team in droves, and often wear their school spirit proudly, win or lose. While a lot goes into creating a successful program, as any fan knows, it often begins with recruiting, which starts well before the student-athletes come to campus. At the core, the game’s top coaches like Alabama’s Nick Saban and Ohio State’s Urban Meyers are in the business of finding and developing the best talent, just like many of the talent acquisition professionals and business leaders that my colleagues and I at LinkedIn work with on a daily basis. So, as you prepare to cheer on your favorite team this fall, what can we learn from college football recruiting about corporate talent acquisition? A lot more than you may think. College football coaches know that when it comes to play calling and game strategy, they can only innovate so much, and top talent combined with a strong culture and leadership usually leads to success on the field. That’s why they start the recruitment process early and work closely with their large staff to source, evaluate and connect with the top recruits. By the end of the process, the coaches often have personal relationships with the players and their families to truly know the driving factors behind the players’ decision. As a talent acquisition professional or business leader, how are you building your bench of top talent? With the constant demands and pressure that come with today’s business world, it’s easy feel stuck in a never-ending cycle of too many jobs to fill and not enough time to make it happen. Our research shows that too often, businesses are not building their talent pipeline in advance. One reason for this is the lack of collaboration among recruiters. We all have Outlook calendars with far too many appointments on them, but it’s critical to step back and evaluate - are we doing the right work and are we working together as a team? A strong bench of talent can help you greatly in the future, and it takes planning and collaboration to happen. When you think of the football programs at Tennessee, Southern California and Miami, what one thing comes to mind? A history of success. Despite plenty of mediocre seasons over the last 20 years, these programs are often ranked in the top 10 all time and for good reason-they have built and maintained their talent brand. Fans may come and go with the win and loss record, but top players are attracted to a history of success and the opportunity to make a difference. Top talent in today’s workforce wants to work around other top talent, and the best employer brands draw them in by putting their own talent front and center. They leverage their own employees as ambassadors to reach top recruits, driving home what makes their organization so special. Top football programs just don’t show up at local high schools and expect recruits them to sign on the dotted line after a 30 minute interview so why should we expect the same from potential candidates at our organizations? Just like football coaches work with their marketing partners throughout the university to develop a brand, talent acquisition must do the same by leveraging the marketing expertise within their organizations and investing to build brand equity. 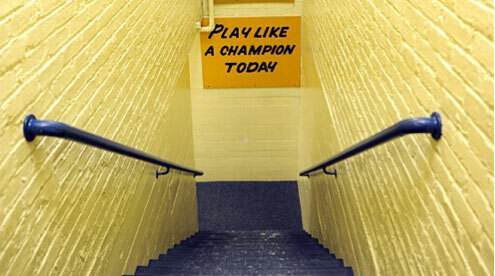 Over the entrance to the tunnel that leads players into Notre Dame Stadium, home to the Fighting Irish football team, hangs a sign reading “Play Like a Champion Today.” It’s become an iconic symbol of success as a motivator for players to uphold the school’s storied past. Notre Dame hasn’t won a national championship in 25 years, but that signs still hangs in the tunnel and they remain near the top of Forbes’ most valuable college football teams year after year. When their head coach, Brian Kelly, was recruiting talent that led to their appearance in the 2013 BCS National Championship Game, did he dwell on the past and their consecutive years of disappointing 8-5 records or did he cast a vision of what could be? Every business experiences ups and downs, and often talent acquisition is one of the first departments to see budget cuts. In spite of challenges, how are you shooting for the national championship and motivating your team to play like champions? There will be plenty of days where you will lose top talent or feel like there are never going to be enough hours in the day to accomplish all of your tasks. However, don’t let that stop you from casting a vision of what could be and driving your organization to playing like champion, always. Unfortunately, most talent acquisition and hiring managers will never see the kind of salaries or celebrity of Nick Saban and Urban Meyer, but it shouldn’t stop us from thinking strategically, investing for the future and maintaining a standard of excellence. If we do, success will follow. Good luck this season!